What do you even put on a CV if you’ve only ever been in education and don’t have any work experience? Sure, you may have been forced to write a curriculum vitae whilst at school but, you probably never took it seriously, because, well, you haven’t needed to. By the end of this article, you will be a CV writing grandmaster, with CV skills that’ll have any recruiter calling you in for an interview. I’ll talk you through 10 steps to write and structure a perfect CV. 1. Before you begin, do your research! At the moment, your CV isn’t very impressive. You know it, I know it, the recruiter knows it. But, before we start beefing out your first CV, you need to start by doing some research. …or, at least have a job in mind and pretend that’s what you’re applying for. Research the company and their culture, look at the job description and try and get a feel for the type of person that they are looking for. Don’t just stick to the company website. Social media posts aren’t as strict as a website, so it’s time to start searching for their Facebook, Twitter, Instagram, LinkedIn and even Snapchat to get a better insight into the company culture and how you could fit into the team. Pay close attention to the job ad/description for the role, sometimes there are little nuggets to take away that could be golden on your CV. Why not print out the job advert, grab a highlighter and start marking all the keywords that you see as important, so you can use them as a guideline when highlighting your suitability for the role. As simple as it sounds, start with your name and contact details. This is the first thing the recruiter will see so, best to not start on a bad foot. Check out the examples below, clear, easy to read and straight to the point. It’s that simple, just make it clear and to the point. The opening statement is the first opportunity you get to show yourself off. So, if a recruiter only spends 6 seconds on a CV, then you need to pull the reader in from the very start. The opening statement isn’t the place to reel off your qualifications or write your autobiography, it’s the place to introduce yourself, highlight things that aren’t on your CV and get people interested in reading more. All you need is 3 or 4 lines about yourself. Tell the reader about your greatest achievements or something that stands you apart from the crowd. Think of it as an elevator pitch about you. Highlight something you are proud of. The results you’ve achieved. It’s probably the only place on a CV where you can show some personality, so make sure you use it! Just don’t go overboard, nobody wants to hear about your elbow licking party trick… that’s just weird. “A highly motivated and enthusiastic tech nut! This is probably the biggest empty space on your CV, but it doesn’t need to be! If you have relevant work experience – internships, summer jobs, year in industry, apprenticeships – then this is a fantastic place to show it off. If this is hyper-relevant experience to the role you are applying for, then you need to go into detail about what you did. Did you work on any projects? Which departments did you work in? What were you involved with on a day to day? Who did you work with/shadow whilst you were there? What impact did you have? How did you find the work environment? What skills did you develop whilst there? Any work experience that can support your application and show the hiring manager that you have a genuine interest in your chosen field will help to increase your chances of getting an interview and being hired. You should go into as much detail as possible when talking about the duties carried out whilst in the role. Talk about all the bullet points mentioned above and highlight why this is relevant to the position you are applying for. Should I Include Irrelevant Work Experience On My CV? In short… yes, but I wouldn’t go into too much detail if it isn’t relevant to the job you’re applying for. That 3-month admin job you did over summer, it’s great, shows you can survive in an office environment, but it’s not the most relevant to your application for a Digital Marketing Apprenticeship. A simple, date, company and position, should do. Think of everything that you’ve done at school, college, university or at home that could be relevant. Have you completed any projects during your course or at home with friends? Perhaps you researched and wrote an extensively detailed 2000 word essay? Maybe you’ve built your own computer and keep upgrading, fixing and customising it? You might have renovated a motorbike with your parents? On a student CV the lack of paid work experience is expected so, think outside of the box and look at what you have actually done that might relate. Although the qualifications you have are the same as other candidates, the projects that the course entailed and the skills that you used are completely different to everyone else’s. Your initial research should’ve given you an idea of what the business looks for in a candidate or what the role will entail and if you do have a genuine interest in the discipline, then I’m sure you’re already doing things that employers will want to hear about, no matter how insignificant you think they are. A business looking for a Software Development Apprentice would much rather you highlight the fact that you programmed your own To Do List App in your bedroom to help you organise your time at college, rather than the fact that you were a cashier at Primark. Soft skills are the skills that you can’t get a certificate in. Think of soft skills as the fluff that people say without any meaning. But, these are your ally, if, and only if, you can put some context behind them and show why you have great teamwork or communication skills. Show the recruiter where you have used the skill and back it up with real-world examples. Check out these interviews with well-known CEOs about what they look for in candidates. Remember, soft skills can be anything, so have a look through the keywords that you previously highlighted from the job advert and see what you can relate to. You may not have any additional qualifications, so feel free not to include this section. If you have done any qualifications or awards that the recruiter or hiring manager may be interested to hear about, now is the time to include it. Think, Duke of Edinburgh Award, Microsoft competency certifications, leadership courses, STEM awards, First Aid at Work. Anything that might be relevant to the job or workplace. Remember, always try to give a little explanation about what you learnt, skills you used, how it helps you at work, etc. This could all reinforce your soft skills from earlier. Nobody really cares about your hobbies. They’re a nice talking point, but if you just list your hobbies or interests, then nobody truly cares. If, however, you are looking for a role in Digital Marketing, for example, and you can say that you spend hours on YouTube because you follow the latest content from Neil Patel, Brian Dean, GaryVee or Russell Brunson, then that would show a good interest outside of what is mandatory and work in your favour. Team sports are always a good one to include here as well. They give an example of working as part of a team and give an indication that you can effectively communicate with others. As recruiters we often see this section underutilised. Showing off your interests and hobbies, and relating them back to the job, company or soft skills, to support your application can set you apart from the competition. 9. 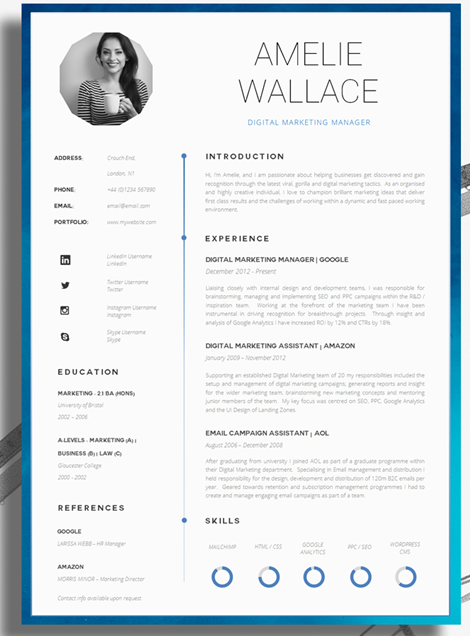 Should I Include References on My CV? Yes, always include two referees at the bottom of your CV. Common practice is to have your two most recent employers, but be smart about this. If your last employers were McDonalds and Primark, but you’re applying for a position in IT, then potentially look for a more suitable referee such as your IT college tutor or the Head of Department from the internship you did. This is the boring bit, but one of the most essential parts so make sure you get it right. You need to make your CV looks appealing to read, so if you’re creative, this could be your time to shine. …frankly, I’d want to set it on fire. Keep it between 10-12, although if you want too you can increase the size of your name so that it stands out, and increase the size of your section heading by a size or two. These help to section off your CV to make it easier to read so, include as many or few section headings as you need, just make sure you use them. Don’t overdo it with colours! The bulk of the text should be plain black, with one constant colour for the section headings if you want to. By themes I mean those quirky designs that Graphic Designers or Art based CV’s have. 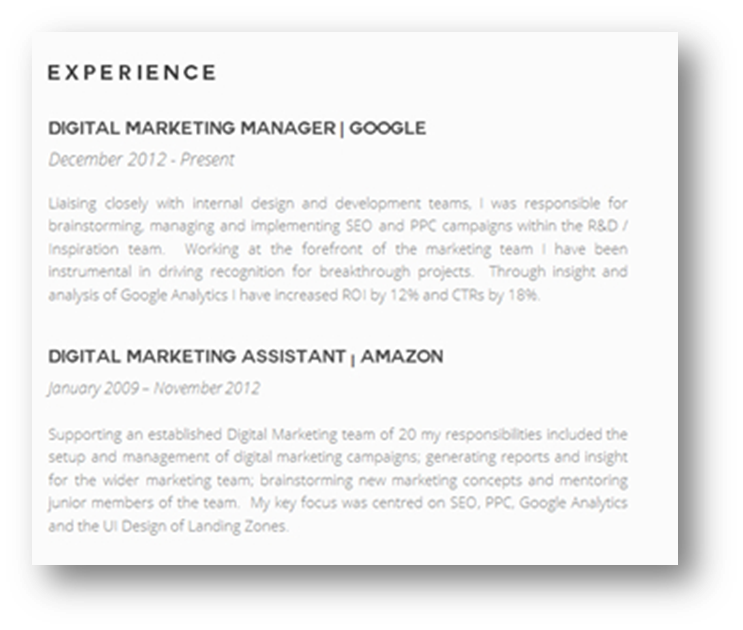 Two great examples of unusual CVs done right! Remember, tailor it towards the job you are applying for. 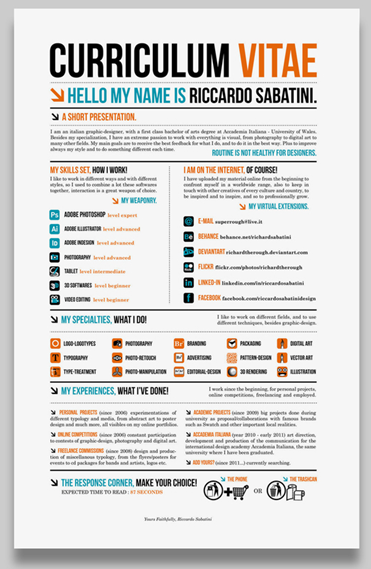 If you’re applying for a Marketing or Graphic Design job, then it’s great! If you’re applying for a role in Accountancy then I would say remaining professional is more important. Make sure you have an order to things. Your most recent experience should be at the top of the experience section, same as your most recent education at the top of the education section. As you gain more experience, you won’t need to repeat the duties under each employer. Thoroughly explain your most recent job and then any unique duties you carried out within previous roles. If you have a degree or college education, there no need to include all of your GCSE grades, just summarise your qualifications with one line. Your CV will be with you for your whole career. You’ll keep updating it every time you look for a new job and it will be an essential part of securing a new role. Keep it professional, but keep it interesting. Congratulations on your first CV!